Mitchell on site, collecting samples. Image courtesy of Ross Mitchell. 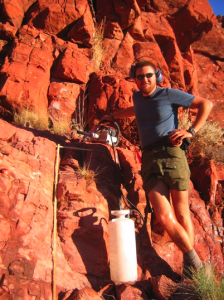 A recent discovery by Yale geologists has ignited interest in a contentious geological theory. The theory of true polar wander, once a competitor with drift theory to explain continental motions, had been cast aside for many years. Discussion of this theory, however, was revitalized in a 1997 Science paper, which was coauthored by Professor of Geology and Geophysics David Evans during his years as a graduate student. The geology community largely rejected the ideas presented in the paper, but now, thirteen years later, the results are far more conclusive. True polar wander is the process by which the entire solid Earth rotates around its core, creating a massive shift in the orientation of the mantle and crust, relative to a fixed spin axis. Physically the phenomenon occurs because the planet seeks to reorient its mass, making the inertia more favorable to rotation. The effects of true polar wander are measurable by satellites, which show the process occurring in the present day. Until recently, however, there had not been good enough reason to suspect that this phenomenon could be responsible for any dramatic changes through long periods of ancient Earth history. The 1997 paper proposed that a ninety-degree rotation of the Gondwana Supercontinent about 500 million years ago in the early Cambrian Period resulted from true polar wander. This year, Evans and two graduate students, Ross Mitchell and Taylor Kilian, published another paper on the Gondwana rotation, with improved data and striking results. By analyzing the magnetization of rocks over a twenty million year period, the group was able to determine that Gondwana underwent a sixty-degree rotation, less than the original proposal, but still at an unprecedented rate of about twenty centimeters per year. Most other continents in the past 200 million years typically moved at a considerably slower rate of three centimeters per year. In fact, the Eurasian plate today, which is comparable in size to Gondwana, moves even more slowly at roughly one centimeter per year. Evans noted that large continents tend to slow plate motion, perhaps due to their deep “keels” dragging across the upper part of the Earth’s mantle. The fast rotation of the enormous Gondwana continent consequently fits well with the idea of true polar wander, which would have produced the rapid motion even while plate tectonic motion was occurring. Evans asserts that plate tectonics alone, or strange behavior in the Earth’s magnetic field, are less likely causes of Gondwana’s movement. There are still many details and aspects about this phenomenon that can be further explored. Taylor Kilian, who is currently working on a five million year range in the Cambrian, commented, “The mechanism causing this motion could be a lot faster than this.” These tests could display rates far more rapid than the group’s minimum estimate of twenty centimeters per year. Ross Mitchell affirms that the simultaneity of Gondwana’s rotation and the Cambrian explosion, a time period during which vertebrate animals greatly diversified, should not be ignored. Mitchell posited that the rotation of Gondwana could have significantly altered the Earth’s atmosphere, making it more conducive for animal development. “It’s safe to say that it’s part of the causal nexus,” Mitchell commented, though more data are necessary to show the extent of correlation. This research has important implications for the understanding of the Cambrian period, as well as the fundamental aspects of geophysics. With these novel insights, other discoveries will derive from these groundbreaking studies over the next couple years.